Package included: 50 × Muffin Holders. Fits:1 muffin. The Plastic Muffin Containers are just the super item everyone needs to have handy at all times. The durable makeup, and beautiful look makes it the #1 muffin containers which you want to have! We designed these Muffin Boxes so you should be able to insert your decorated muffins/large cupcake without them falling around the box and getting messed up. These plastic muffin containers are made big enough(so as not to squash these beauties!) and small enough to fit your baked goods so they arrive safe and neat to the location you are sending it. 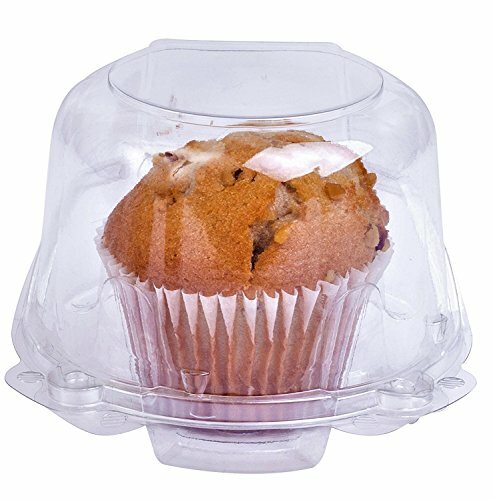 Our muffin holders are designed with an easy to open attached lid, but it is strong enough not to open when not needed. Great for: ✔Weddings, ✔Holiday Parties, ✔Baby Showers, ✔Ice cream parties, ✔Bridal Shower, ✔Birthday Parties, ✔Cupcake Parties, And much more... Just stock up on these Fantastic muffin holder and have them ready for the upcoming Party, Event, or Gathering. CLICK THE YELLOW "ADD TO CART" BUTTON NOW TO GET YOUR MUFFIN BOXES AND LET THE PARTY FUN BEGIN! Dimensions:14.5 x 10.6 x 5.2 inches. APPEALING: These clear domed cupcake holders are the ideal item to own! great for bakeries, restaurants, or just to tempt your family and friends, ! Use it to neatly and tastefully display your baked - or bought,- (shh... we won't tell !). goods. PRACTICAL:Our containers will keep your baked goods fresher, While preventing messes. STURDY: Designed to hold cupcakes in place. Holds 1 Large cupcake or muffin. These easy to open/close containers feature a domed lid for protecting delicate icing and decorations. PARTY-WORTHY: Try these at the next event your'e hosting (or attending). Whether it's a wedding, birthday party, baby shower, July 4 Ceremony, or any get together,these clear containers will be a fashion statement, will make a great place-setting,and will make your treats that much more exciting. HIGH QUALITY, STRONG & SAFE: Made out of high quality BPA Free plastic, so you can use it with peace of mind. If you have any questions about this product by CulinWare, contact us by completing and submitting the form below. If you are looking for a specif part number, please include it with your message.